First of all, I want to wish all my readers a very happy new year. Hopefully the holiday season has been good to you all, with lots of joy, family, friends, and good food. The complete review is pasted below and can be found on the IndieReader website, here. On a personal note, I want you all to know that I plan to blog more in 2014, hopefully with lots of new posts about the writing process as well as good news about book one, as well as books two and three, as I move forward with making them available to readers. IR Verdict: BOBBY ETHER AND THE ACADEMY is a thrilling action-packed adventure you never want to end. BOBBY ETHER AND THE ACADEMY reels you in from the first line: It would take a miracle to win the game. And, lo and behold, fourteen-year-old Bobby somehow, miraculously, makes the last-second shot to defeat his basketball team’s middle-school rivals – a shot that oddly veers from its initial woefully short trajectory. The team cheers, but where, he wonders, could his parents be? From this moment on, Bobby’s life will never be the same. Bobby clearly has some kind of mysterious power, and as soon as the game is over, Bobby finds himself hotly pursued by various shadowy figures. There’s Cassandra, a strange woman who claims to know Bobby’s grandfather and offers to protect him from evil. Simpkins and Hayward, two dangerous henchmen, eventually capture Bobby. They take him to the Academy where he is told he is now an orphan. Headmistress Grayson convinces Bobby it is in his best interest to stay at the Academy, train with the monks, master his abilities, and use those powers to avenge his parents’ death. Bobby is hooked. Until…Bobby graduates from being the awkward inept newbie to the hero who eludes bears and discovers the giant colony of diffident paradoxa mushrooms – highly prized by Headmistress Grayson. His exalted celebrity status sets off a chain reaction as Bobby and his pals grow more and more curious as to the true purpose of the Academy, and how it is that Bobby came to be there. Boyer knows how to build suspense and leave you hanging at the end of every chapter, eager to read on. His chapters are short, too, so before you know it, you’ve spent the entire afternoon with Bobby Ether and the Academy. Without a doubt, this book evokes a more well-known tale of a boy wizard finding his way in a strange school. But no matter, Bobby’s story is great fun and compelling. 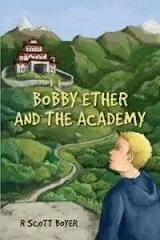 BOBBY ETHER AND THE ACADEMY is a thrilling action-packed adventure you never want to end. Reviewed by Lucy Wang for IndieReader.